Took a little excursion to Grand Prospect Hall today - we're working on a wedding that will take place there this spring. Built in the 1890's, it was the first establishment in Brooklyn with electricity. 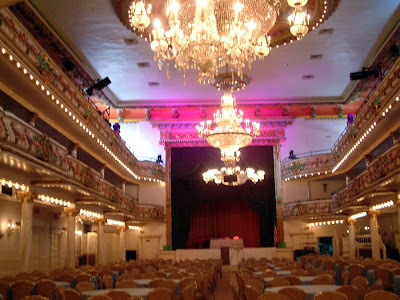 Since then it has served as an opera house, the home to a Masonic club, a speakeasy during prohibition, and the site of Rudy Guliani's wedding. 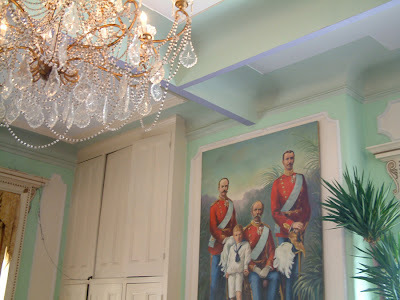 Today its over the top with embelishment - palms, candy colored paint and murals of no-name royalty. I love it. That central ballroom is phenomenal! I can't wait to see pics of your gorgeous flowers there. 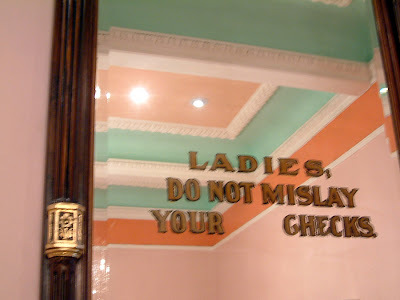 what does 'do not mislay your checks' mean? was trying to figure it out.